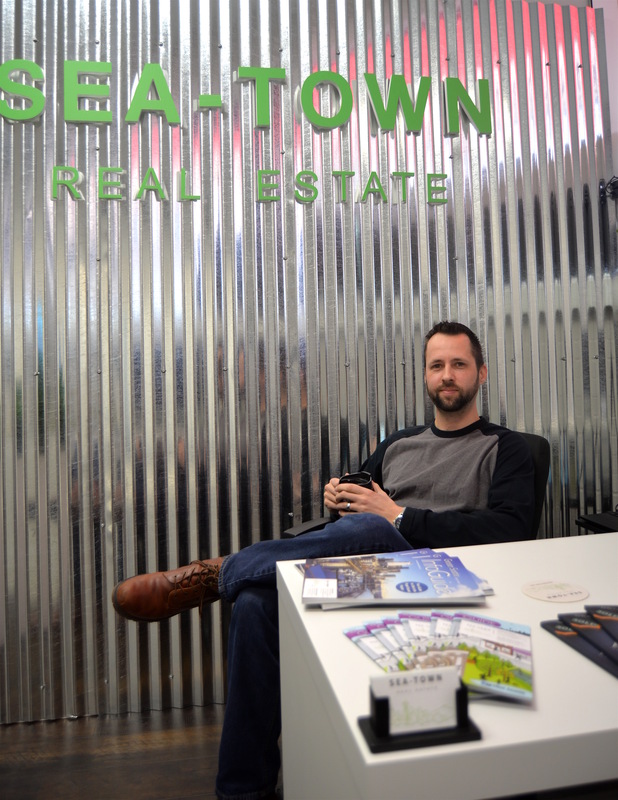 West Seattle resident Christian Harris started his company Sea-Town Real Estate a year ago, with a mission to do community outreach through the business. West Seattle resident Christian Harris wants to break the mold. Just because realtors have worked in certain ways in the past doesn’t mean he wants to follow in their footsteps. In fact, he’d rather shake things up a bit. Harris started his company Sea-Town Real Estate a year ago, with a unique vision. He didn’t want to gauge his success on becoming a top producer or selling the most expensive houses. Instead, his goal was to use real estate as a vehicle to make a difference. For example, for each transaction, agents at Sea-Town are encouraged to donate a percentage of their commission to the charity of the client’s choice. The brokerage then matches that amount. The way it works is simple. If a representative of a non-profit recommends the real estate firm to a new client, Sea-Town will donate 25 percent of the proceeds of the transaction to that cause. Harris explained that with median home sale prices in Seattle now $700,000, the average donation to the non-profit would be about $5,000 for one referral. Harris is selecting a few prospective recipients for clients who do not have a non-profit preference. Sea-Town will do more than make financial donations to the selected organization. They will help with marketing. First, the real estate company will interview the non-profit on its podcast. The regularly broadcasted program highlights businesses in the community. Then, Sea-Town will fund a high-quality video about the organization to help raise awareness. “The idea is to provide free content to the nonprofit,” Harris said. The organization can then use the video to promote itself online. The first non-profit selected for this program is WestSide Baby. Nancy Woodland, executive director of the nonprofit, met Harris a couple years ago, when he volunteered with the group as part of an outreach program with his church. “Connecting in anyway is fantastic, and sometimes it leads to something totally different and new that you could have never expected,” Woodland said. Later, when Harris started the real estate firm, he continued to talk to WestSide Baby about ways to help their cause. Harris interviewed Woodland for his podcast. “It gave me a great platform for getting the word out about WestSide Baby,” she said. With SeaTown’s Community Partnership Program, Woodland said Harris is demonstrating a clear understanding of how a business can truly help a non-profit. Harris’ path to real estate is just as unconventional as his outlook on the business. At first, he wanted to be a musician and played bass guitar, living with a group of talented roommates, all in bands. Then, Harris learned finish carpentry from a friend and stayed in the trade for 15 years, before joining the army. After serving in the military, Harris decided he wanted to enter a business that had the potential to benefit his customers. Harris explained that each agent was essentially a one-man band, and he had a lot of catching up to do to the more experienced co-workers. Each agent acted as an independent contractor and was responsible for drumming up their own business. He believed that the current system was antiquated. He found himself spending a lot of time helping older agents with technology and felt that much more could be done to bring the field into the current age. Providing agents with more training, support and resources would be another way to make a difference, Harris said. His overarching mission was to make real estate a better experience for agents and clients. Harris opened Sea-Town by himself, and the firm has grown in the past year to include seven agents. The company moved into its current space last summer. Agents with big hearts are drawn to working for the company, Harris said. For more information about Sea-Town Real Estate, visit www.sea-town.com. For more information about WestSide Baby, visit http://westsidebaby.org. Hmm. I also am a Realtor who has worked with Christian a few times. I don't remember seeing anything on his clients' closing statements about donations, as that's where you would typically see them for accounting purposes. I'll have to double check. Thanks for the time Lindsay and for helping get the word out there. Hopefully this piece will help encourage other business owners to think about different ways they can partner with local organizations and make a difference as well. In response to "Hmm. I also am a Realtor...", thanks for 'double checking' on me and my client's closing statements but we make the donations ourselves, after closing, not from Escrow. Let me know if you want to know more about the details of the program... would be happy to share and brainstorm how we can all do more to serve our communities.